The first release of the new film festival Young, in cinema !!! seeks to encourage young people to think critically about the content they are watching and will be held by 6. to 8. February at the Zagreb Cinema Tuškanac. 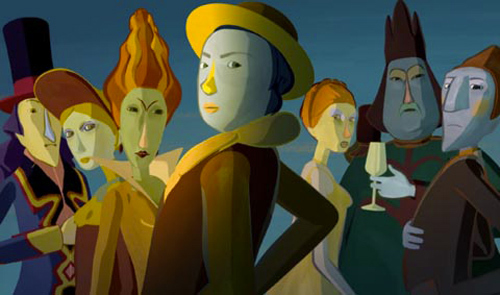 In the presence of director Marie-Christine Courtes festival opens animated film Under your fingers who was in the pre-selection for this year's Oscar. This short film depicts the young Emilie, who, during her cremation, recalls Indochina at the time of Ho, her love encounter with the French immigrant, the birth of Linh (her mother), the war, her departure from the country and her arrival in France. The next day in the program are two short films - Princess Marie-Sophie Chambon, a girl who wants to be a princess, but finds it much better to be astronaut, and The head of the wolf Alice Vial of the lonely girl whose comfort the doll wraps her head. The last day of the festival is an animated film Picture Jean-Francois Laguionie, whose work takes place within a painting depicting a castle, a garden and a forest, and where unusual characters live, the unfinished work of their author. All the films have Croatian and French podcasts, projections are free, but for a limited number of places, previous applications are required. The Festival is organized by the French Institute in collaboration with the French Festival of Educational Film in Evreux.